Baba Ramdev has been credited for venturing into industries and conquering them just like it did with the Patanjali retail products line-up. Now after garnering some solid success in retail, the Ramdev led venture has decided to set foot in the telecom sector. To make this happen, the company has decided to partner up with the state owned teclo, Bharat Sanchar Nigam Limited. The Patanjali SIMs which Ramdev will launch will be named as ‘Swadeshi Samriddhi SIM cards’. These SIMs will operate on BSNL network and will come with an exclusive plan of Rs 144 which will be valid only for Patanjali SIMs. During initial days, this plan will solely be available for Patanjali employees, however the company is expected to extend the telecom services to public shortly after. Not only the special tariff plan, but the Swadeshi Samriddhi SIM cardholders will also get additional benefits such as 10% discount on Patanjali products, health, accidental and life insurances and more benefits will be added in the future. Coming to the BSNL Patanjali plan of Rs 144, it gives the user unlimited voice calls without any limit to any network in the country except to Mumbai & Delhi circles, 2GB of data and 100 SMS for the validity period of 30 days. These plans can be availed in three denominations: Rs 792 with 180 days validity and Rs 1584 for 365 days validity. “Patanjali’s plan is BSNL’s best plan. In Rs 144, one can make unlimited calls from any part of the country. We are giving 2 GB data pack, 100 SMSs. The members of the Patanjali has to just show their identity and there SIM will be activated soon after some paperwork,” a report from ANI said. Baba Ramdev also appreciated BSNL for coming forward and partnering with them. Talking about the medical and life insurance covers offered by the Swadeshi Samriddhi SIM card, it’s Rs 2.5 lakh and Rs 5 lakh respectively. The insurance covers can be availed only for road accidents. And users can pick up these SIM cards from the five lakh counters of BSNL when the service opens to the public. “There are five lakh counters of BSNL, and from there people can soon get Patanjali swadeshi-samradhi card,” Ramdev said. He also added that BSNL is a ‘Swadeshi network,’ so this partnership is for the welfare of the country. As mentioned, this plan is exclusive to the users of Swadeshi Samriddhi SIM card holders. 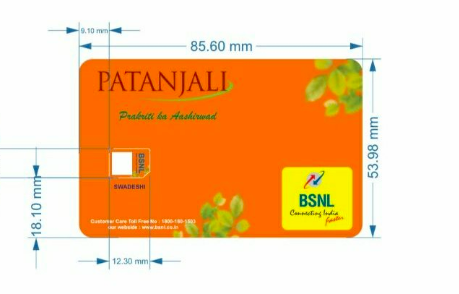 If you’re an employee at Patanjali, you can pick up the SIM card right away. Patanjali SIM's plan is in direct competition with other leading players like Jio and Airtel. BSNL on Tuesday tweeted details of the new recharge pack- 'BSN-Patanjali -144 plan'. 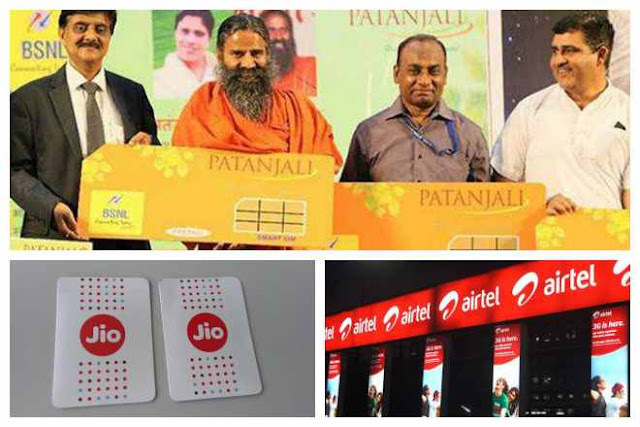 With the launch of Patanjali-BSNL Swadeshi Sammriddhi SIM for Patanjali employees, members of its associated organisations and those holding Swadeshi Samriddhi Card offered by Yoga guru Ramdev’s organisation, the comparison of cheapest telecom plan has become inevitable. Patanjali SIM’s plan is in direct competition with other leading players like Jio and Airtel. BSNL on Tuesday tweeted details of the new recharge pack- ‘BSN-Patanjali -144 plan’. Other plans that have been launched by Patanjali-BSNL are priced at Rs 792 and Rs 1,584. Patanjali-BSN Rs 144 vs Jio Rs 149 plan vs Airtel Rs 149 plan: After a user recharges Patanjali Swadeshi Samriddhi SIM card with the recharge pack of Rs 144 they get a total of 60GB of data for a month with a daily limit of 2GB. Apart from it, customers will also get unlimited calls and 100 messages. The duration of the pack is 30 days after which a user will have to recharge their SIM to enjoy the benefits. Those holding Swadeshi Samriddhi SIM Card will also get medical insurance and life insurance benefits worth Rs 2.5 lakh and Rs 5 lakh respectively. Reliance Jio: Under its Rs 149 plan, the company offers a total of 42GB data with 1.5GB per day limit. Along with the data, Jio also offers unlimited voice call and 100 SMS per day. Users also get a complimentary subscription to all Jio Apps. Airtel: Its Rs 149 plan offers 1GB data per day for 28 days. Apart from it, the company offers unlimited call benefits and 100 SMSes. Way back in 2015, we were the first to report that Patanjali will enter the apparel market, to compete against the likes of Nike and Adidas. Now, this news has been confirmed. Patanjali promoter and co-founder Baba Ramdev has confirmed that they will enter into apparel and fashion market. Besides, their aim is to beat HUL in their own game; and they are seeking Rs 5000 crore loan for expansion. What else can a Yogi disrupt now? During the inauguration of Patanjali Gramodyog in Alwar, Baba Ramdev declared that they will now manufacture clothes, and enter the lucrative apparel market in India. They will make everything from underwear to ethnic garments, sportswear and more. ‘Swadeshi’ will be the punchline, under which these new ‘arrivals’ would be sold. Breaking the ‘monopoly’ of foreign manufacturers is what the aim is. They have recently launched ‘Divya Jal’, which is aiming to disrupt the market of mineral water in India. Patanjali is right now experiencing tremendous success in their FMCG business, as they clocked sales of Rs 10,000+ crore during 2016-17. We had reported yesterday that Patanjali co-founder Balkrishna has now assets worth Rs 70,000 crore, which is 173% more compared to last year. Now, Patanjali is aiming a business turnover of Rs 100,000 crore in the next 3-4 years. Their newest target is to beat revenues of Hindustan Unilever (HUL), which had generated revenues of Rs 34,000+ crore last year. For this major expansion, they are seeking loan of Rs 5000 crore. Baba Ramdev said, “Patanjali’s revenue will be more than HUL’s (Hindustan Unilever Ltd) in 2018-19. To support this growth, we’ll need to borrow over a period of time,”, adding that they want to become “largest packaged goods company in the world by 2020-21”. As per reports, Patanjali has already hired investment bankers for this loan, and looking for equity-linked fundraise options. As of now, Patanjali has a debt of only Rs 300 crore. We will keep you updated as we receive more news and views about Patanjali’s aggressive market expansion plans.